In the battle between a dodgy melted handset and a fresh premium blower, we reckon the latter wins out every time. 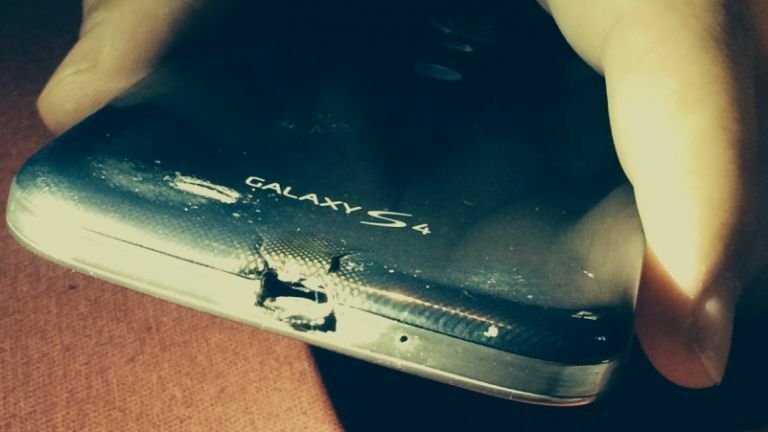 A scorned Samsung Galaxy S4 owner has been gifted a free HTC One M8 after his Sammy handset caught on fire and melted. Reddit user TweekTheGeek woke to a smouldering smartphone last month, and since then Samsung's done little to resolve his issue. "I have tried multiple times since then to contact Samsung via phone, and through their Reddit, Facebook, and Twitter accounts and have been completely ignored," says the disgruntled Redditor. "When I call them, I generally am able to speak to a representative for a total of 5 minutes, and then I am placed on hold for about 30-50 minutes before either my call is disconnected, or I am transferred to a voicemail where I have left multiple messages." Fortunately a product mananger for HTC's phones in the US jumped into the fray and offered the disappointed S4 owner a brand new HTC One M8 smartphone free of charge. Interestingly, the caveat to HTC's deal was that TweekTheGeek would have to promise to flog whatever complimentary Samsung device he might receive on eBay and donate the funds to a charity of his choice. We spoke to Leigh Momii, the product manager at HTC America, to find out all about the courtesy handset. "This is not my first interaction with customers on Reddit, but it is the first time I have directly publicly offered a device to someone on Reddit," Momii told T3.com. "We want to put a face to the company and let people know that we are easily accessible. HTC is nimble, we're small and accessible. We can respond quicker than our competitors and make everything from the product to customer care more personal." According to Momii, it was TweekTheGeeks calmness in the face of adversity that won the HTC rep over to his cause. "He took the time to explain his situation clearly and thoughtfully. Not all customers take the time to write up something thoughtful and do it without bashing," explains Momii, speaking to T3.com. "He seemed like a deserving person and someone who would be truly grateful of an offer of a free m8. We really value our loyal customers at HTC and they make us who we are. We want to add someone like TweekTheGeek to the team"
The HTC One M8 is a stellar handset with a premium feel, and Momii's keen to point out the handset's virtues over Samsung's smartphones. "I would say our design and BoomSound are really the key differentiators. We design our products with the customer in mind first," boasts Momii. "With competitors, they think about volume first and how they can create a phone that they can sell a lot of. I don't think this requires much explanation – you can tell just by looking at the craftsmanship and thoughtfulness of our products. " "To top it off we throw in HTC Advantage to push it over the top. A free screen replacement in the first 6 months gives customers confidence when buying an HTC One m8." So the question we're all asking - did TweekTheGeek accept the courtesy smartphone and make the switch to #TeamHTC? "Yes he did follow through," says Momii. "I have his information and will be sending him the device this week." If you're looking to snag yourself a free HTC handset but your phone hasn't spontaneously combusted, stay tuned to HTC's Shen Ye's twitter page for a big summer giveaway on Friday.